Last fall UBC offered the Alpha Course as a way to return to basics of our faith, build community, and begin to share our faith with others. At the end, just about everyone admitted that one of their favorite parts of Alpha was getting to know everyone else. The opportunity to hang out with other people and just talk about the stuff that makes up our lives with refreshing. Several people demanded that we continue to meet regularly to share a meal and our lives. So...we are. 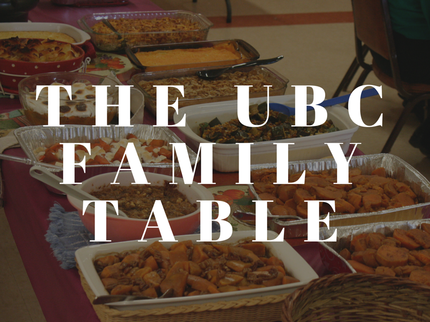 It's called UBC Family Table -- which is a fancy way of saying we are getting together twice a month to share food, to share our lives, and to share Christ with one another. It's potluck, so bring something to share if you can. If not, just bring yourself -- seriously. There's always enough and you are always welcome. Family Table is on the 2nd and 4th Wednesdays of every month. See you then!